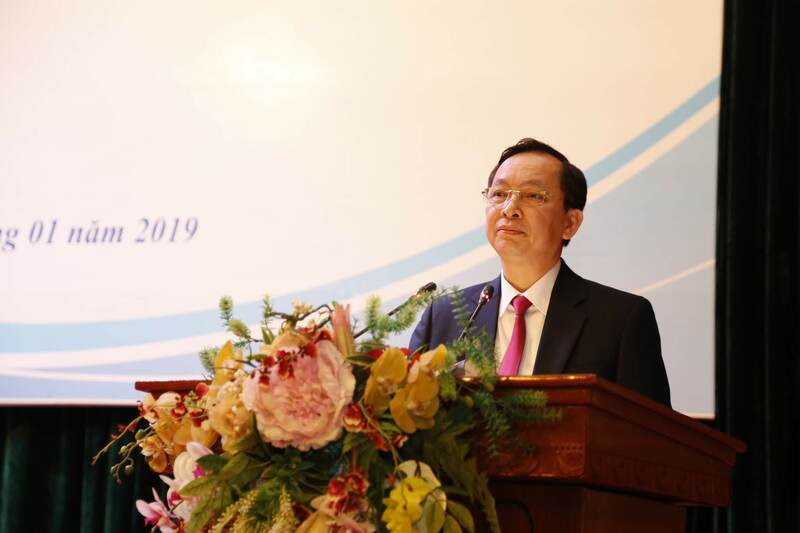 “The DIV's achievements have contributed to the overall performance of the banking sector, thereby strengthening public confidence in the credit institution system as well as the trust of domestic and foreign enterprises in monetary and credit stability”- Standing Deputy Governor Dao Minh Tu of the State Bank of Vietnam (SBV) addressed upon attending DIV’s conference on implementing tasks in 2019, held on January 22th in Hanoi. Also attending the conference were representatives of the Banking supervisory agency (BSA) and some other departments of SBV. On the side of DIV, there were Mr. Nguyen Quang Huy, Chairman of the Board of Directors and members of the Board of Directors; Mr. Dao Quoc Tinh, General Director and members of the Board of Management; Controllers and leaders of DIV's departments and branches. In his opening speech, Chairman Nguyen Quang Huy affirmed that 2018 was DIV’s important transitional year of implementing deposit insurance (DI) policy and some tasks specified in the Law amending and supplementing the Law on credit institutions. In particular, DIV actively directed relevant units to support and coordinate with the SBV provincial branches and local authorities to deal with complex situation of the People’s Credit Fund (PCF) operation; built up the plan and resolution measures to propose to the SBV; together with assigning staff to participate in working groups under the direction of the SBV. Mr. Nguyen Quang Huy said, in 2018, DIV successfully organized the 16th Annual Meeting and International Conference of Asia-Pacific regional committee (APRC) in Hanoi. Thanks to the special guidance and support from the SBV in general and Deputy Governor Dao Minh Tu in particular, DIV has completed the FSMIMS Project and effectively implemented in the whole system. Grasping the direction of the Government and the SBV, proceeding the achievements in 2018, DIV would keep on concentrate its resources and unite to complete the key tasks of the whole system in 2019. At the conference, many important issues were discussed such as DIV’s summary report of 2018 and operational orientations for tasks in 2019; Report on emulation and reward in 2018 and emulation movement in 2019; Report on the operation results of the Steering Committee for supervising, examining and handling troubled PCFs, etc. At the conference, many discourse reports on deposit insurance expertise were also presented, specifically: DIV’s participation in restructuring the CI system along with handling non-performing loan - a year in review; International cooperation’s significant contribution to DIV’s operational efficiency improvement; Some recommendations for coordinating with the SBV’s branch in Dong Nai to develop the resolution plan for weal PCFs. According to DIV’s 2018 summary report and the task implementation in 2019, following the orientations for the objectives and mandates of the banking sector, being closely directed by the SBV, in 2018 DIV's leaders and staff have actively carried out professional activities, completed assigned tasks to protect the legitimate rights and interests of depositors, contributing to ensuring the safety of banking operations. On the research and proposal for policy mechanism, DIV focused on ideas to effectively implement the Law amending and supplementing a number of articles of the Law on Credit institutions; to deal with problems upon the participation in special control and restructuring CIs under the direction of the SBV; to coordinate with relevant ministries and agencies for the amendments of other DI legal documents. DIV has actively implemented and completed the administrative and professional guiding documents as planned, especially the guidance for newly issued circulars; concentrated on developing the Regulation on buying long-term bonds of supporting CIs, promulgating the Regulation on special lending for CIs under special control, etc. In general, the administrative documents have basically met the legal basis for the expertise activities pursuant to the Law on DI. DI policies and operations have been effectively implemented by the DIV. As of December 31, 2018, there were 1.282 organizations participating in DI system, including 94 commercial banks and foreign bank branches, 1 co-op bank; 1.183 PCFs and 04 microfinance institutions. The issuance and revocation of DI certificate have been promptly and properly performed by the DIV, which meets the needs of CIs and partly affirms DIV's role and position as well as enhances public confidence in the banking system. DIV has well executed the management and collection of DI fees; actively supervised, supported and responded to the inquiries and promptly handled violations in fee calculation and payment. In 2018, DIV has collected a total actual fee amount of VND 6.628,5 billion, reaching 100,7% of the plan, increasing 13% compared with 2017. The fund management and investment is carried out in accordance with relevant regulations, with safety and efficiency, contributing to the fund development, creating additional resources for the operational fund and improving the DIV's financial capacity. Most of the temporarily idle fund has been invested in Government bonds. In 2018, there was no payout, but the DIV constantly sticked to the operations of insured institutions, actively prepared payout plans for the likely payout obligations. To enhance the supervision of insured institutions, DIV cooperated with the SBV on the effective implementation of the information sharing and off-site supervision under the Circular No. 34/2016/TT-NHNN dated December 28, 2016; promulgated the guidance on implementing the Regulation on supervision of insured institutions. In 2018, DIV effectively implemented the Regulation on information and reporting of insured deposits, issued and organized the guidance on the implementation of such regulation to 100% of insured institutions and trained over 90% of insured institutions with a total of 2.312 participants. As of December 31, 2018, DIV has completed on-site inspections of 354 insured institutions including 25 commercial banks, 329 PCFs, reaching 100,6% of the 2018 plan. Besides, in 2018, DIV completed the review of internal regulations relating to the deposit taking process for insured institutions; collecting PCF system operations, proposing opinions to consolidate, correct and sustainably develop the PCF system to report to the SBV. Activities of the Steering Committee and groups for supervising, examining and handling troubled PCFs have been carried out in a consistent, timely, effective manner throughout the whole system. Communication activities were actively performed toward diversifying the contents and appearance while focusing on exploiting new mediums such as organizing exchange program with university students upon DI policies; coordinating with the SBV branches, local unions to hold events and activities to raise DI public awareness nationwide, drawing the attention and appreciation of organizations, social unions, and depositors in the area. The training for officials have also received considerable attention from the DIV; the applied research was actively and effectively executed. International cooperation activities have been enhanced to improve the experience sharing and the efficiency of DI system in Vietnam. The successful organization of the 16th Annual Meeting and International Conference of APRC 2018 under the theme "Small and medium sized insured institutions: What we can do for them?” has been recognized by domestic and foreign institutions, somehow raised the reputation and position of DIV regionally and internationally. Addressing the direction at the conference, SBV Deputy Governor Dao Minh Tu highly appreciated DIV's 2018 results on the following aspects: basic improvement of the legal framework; supervision, examination; international cooperation etc. In particular, the DIV has promoted its position in maintaining the safety and promoting the process of restructuring the system of CIs, especially for PCFs. The achievement of DIV contributed to the overall results of the banking sector, supporting the consolidation of public confidence in the CIs system, of market confidence in the monetary and credit stability. Actively propose and recommend to the State management authority to develop legal documents on DI, especially the guidance on the Law amending and supplementing some articles of the Law on CIs. Actively participating in the restructuring of CIs in general and PCFs in particular under the direction of the SBV, especially the Directive No. 06 dated October 2, 2018 of the SBV Governor with such key points as increasing the role of DIV to engage in supporting and handling weak PCFs under special control. “Recently, DIV has well proved its responsibility and SBV is totally assured of DIV’s consultation and opinions” - Deputy Governor addressed. Coordinating with relevant agencies to enhance the public awareness of DI policy and protect the interests of depositors and PCF members, while at same time assure public confidence in the DI policy and banking operation. Promoting the role of supervision and safety warning of operational safety for PCFs as well as the CI system, especially deposit safety. Completing DIV’s development strategy to 2025, vision to 2030, and report to the SBV to submit to the Prime Minister; concentrating resources to build the implementation plan of the strategy after Prime Minister’s approval. It is necessary to have a long-term vision while building the strategy to orient DI activities in the coming time. Accomplishing the summary of the Law on DI implementation, studying and proposing the amendment and supplementation of the Law for a better legal basis to participate more effectively in the process of restructuring the CI system, approaching the international standards of DI.Continue to strengthen the organizational structure, professional processes; improve the human resource quality, effectively implement the assigned tasks to protect the legitimate rights and interests of depositors, contribute to maintaining the stability and safety and accelerating the process of restructuring CIs. On behalf of DIV staff, Chairman Nguyen Quang Huy expressed the sincere thanks for the deep concern and close direction of the SBV's leaders, Deputy Governor Dao Minh Tu and affirmed that DIV would comprehend and grasp the above direction of the Deputy Governor to fulfill the mission to protect the legitimate rights and interests of depositors, contribute to ensuring the safety of the banking system and social security. Hence DIV recognized its great responsibility, understood more clearly the task to focus on the organization's activities; as well as identify the specific directions, strategic objectives and appropriate solutions to successfully implement the assigned mandates. “In the coming time, despite the numerous challenges, DIV also get the obvious opportunities, especially the regular, close and timely direction and concern from the SBV. Besides, it is the coordination of all local levels, branches and agencies at the DIV’s operation area. This is a source of great encouragement and stimulation that offer DIV the strong belief in the path ahead” -Mr. Nguyen Quang Huy emphasized. Chairman Nguyen Quang Huy proposed that DIV’s leaders and staff should unite and make joint effort to overcome themselves, make use of favorable available conditions as well as the support from other ministries and agencies, especially the direction of the SBV to turn DIV into an ever-growing organization. At the conference, SBV Deputy Governor Dao Minh Tu awarded the title of Emulation Fighter for the banking industry to DIV’s 13 individuals who had outstanding achievements in the period of 2015-2017; SBV Governor’s certificate of merit to DIV’s 13 collectives and 28 individuals who had the excellent achievements and contribution to the banking industry in 2016-2017. On the conclusion remarks of the conference, DIV General Director Dao Quoc Tinh gave specific instructions for the departments and branches in the whole system of DIV on DI expertise such as supervision and examination of insured institutions, participating in restructuring CIs; summarizing 5 years of implementing the Law on DI; building DIV's development strategy, etc. At the same time, it was suggested that all DIV leaders and officials at the Head Office and 8 regional branches should promote the solidarity spirit and collective strength towards building a sustainably growing organization; thereby contributing to improving the position of DIV in the restructuring process of the CI system, protecting the legitimate rights of depositors and maintaining the safe and healthy banking operation.